Every time you shop you will earn points towards special bonuses every time you shop at Redbank Plaza. Enjoy exclusive competitions and deals plus you can spend your points on great prizes including free coffees, free gift vouchers, ipads and more! 3. 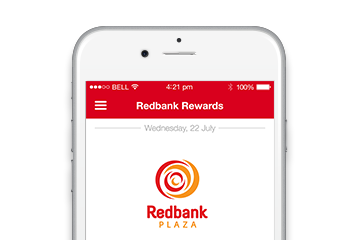 Enter Competitions: receive entries for exclusive Redbank Rewards only competitions, or additional bonus entries for other Redbank Plaza and Retailer competitions.